As we approach the end of a phenomenal year, I look back to see what happened in 2017. Canada turned 150, locally Mission celebrated its 125, and the Foundation marked its 30. We added new faces to the Foundations family and welcomed Candie Thorne and Linda Clarke as new board members. 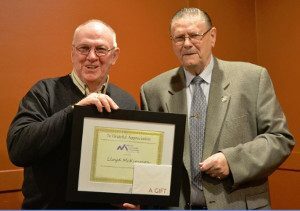 Lloyd McKimmon, who joined our board as a temporary maternity leave member 2 years ago, is leaving us as of December 31, it’s been a pleasure to have him on our board and we will dearly miss him. We also added new committee members this year. Gail Hildebrandt, Eleanor MacDonald, and Bernadine Babuik joined the development committee and KC McPherson and Gloria Tyler the distribution committee. Our beloved benefactor, Claire Clemo passed away leaving a legacy that will help our community for years to come. We saw the birth of 2 new funds: Caring fund and Legendary GoldEdge Sports fund as well as the fulfillment of the Animal Welfare Fund. 56 students received scholarship opportunities and 27 organizations received grants for a total of $86,525.00. You have donated just over $76,000 this year to the Foundation, doubling the amount received in 2016 and we thank you very much for supporting us. Our community has proven that it cares about the welfare of the citizens and organizations in Mission through the funds created at the Foundation. Our group of volunteers are proud to be stewards for our community and we all look forward to what 2018 has in store.